Now, in a perfect world your raid would communicate with you flawlessly. You would know which shaman is earth shielding which target, and no priest would ever overwrite another priest’s POM. 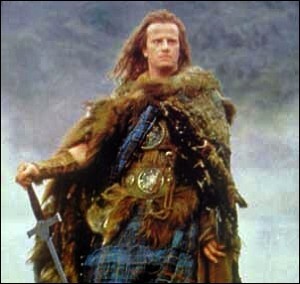 But this is an imperfect world, and in a large raid, this can all get muddled. Note: this lesson is NOT for beacon (BACON!). You can have 2 bacons on the same target. They don’t overwrite. At least not last time I checked. For the sake of this example, we’re going to use Earth Shield. 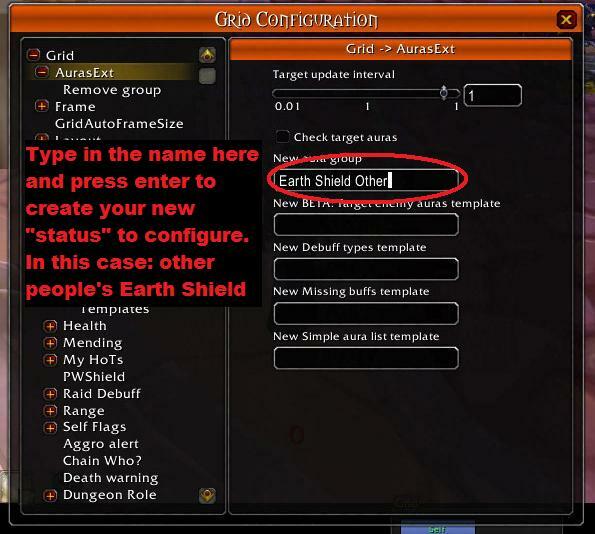 (1) Activate both “My Earth Shield” and “Buff: Earth Shield.” You will find “My Earth Shield” under “My Hots” and “Buff: Earth Shield” under “Auras”. (2) They should be different colors. I will make “Buff: Earth Shield” brown and “My Earth Shield” pink. 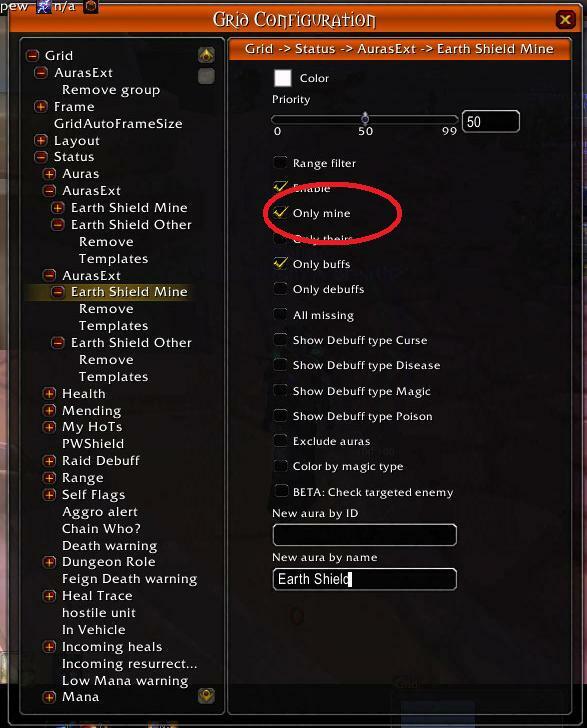 (3) For “Buff: Earth Shield” make sure you uncheck the “show mine only” box. 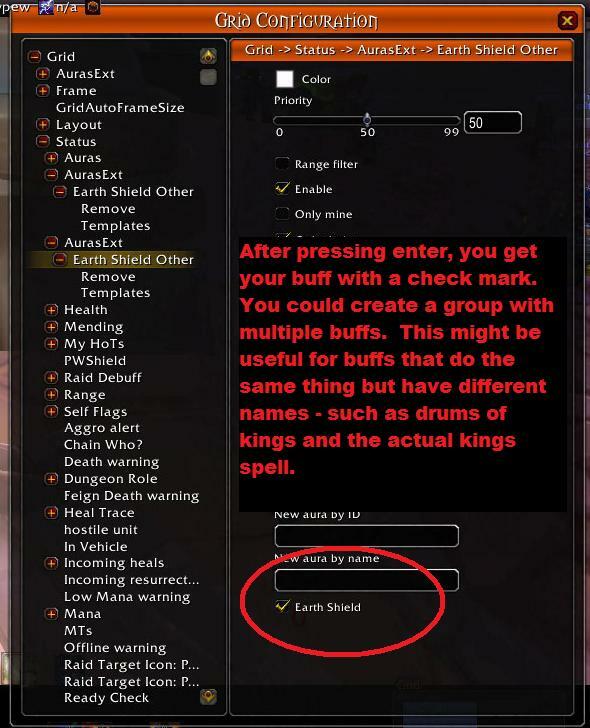 (4) The priority on “My Earth Shield” needs to be higher than the priority for “Buff: Earth Shield.” This is because Buff: Earth Shield will show any earth shield on the target, including your own. The whole point is for yours to look different and cover the default. 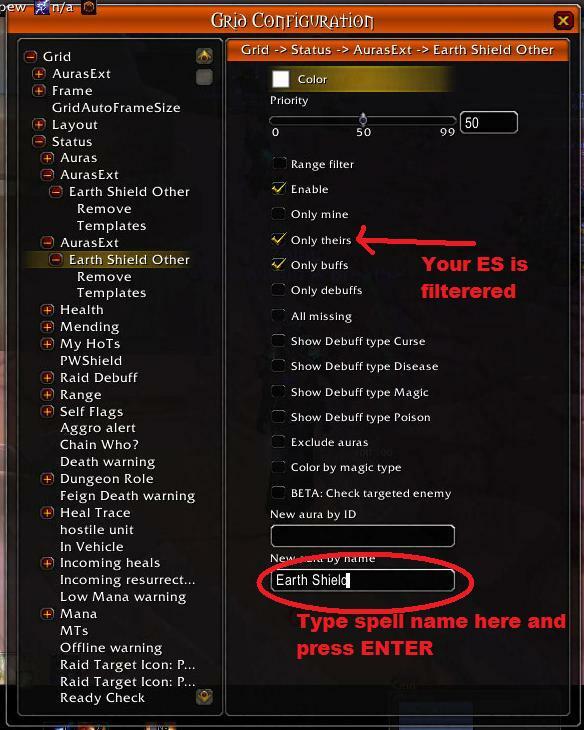 Pick a corner, and check both “My Earth Shield” and “Buff: Earth Shield.” I wouldn’t put anything else in that corner. It will just complicate things. 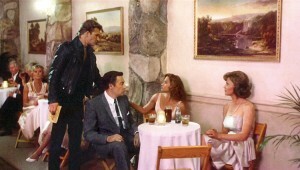 For this example, we'll put it in the bottom left corner. Why not? 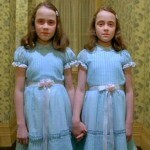 There can be only… two? Grid is not THAT scary. 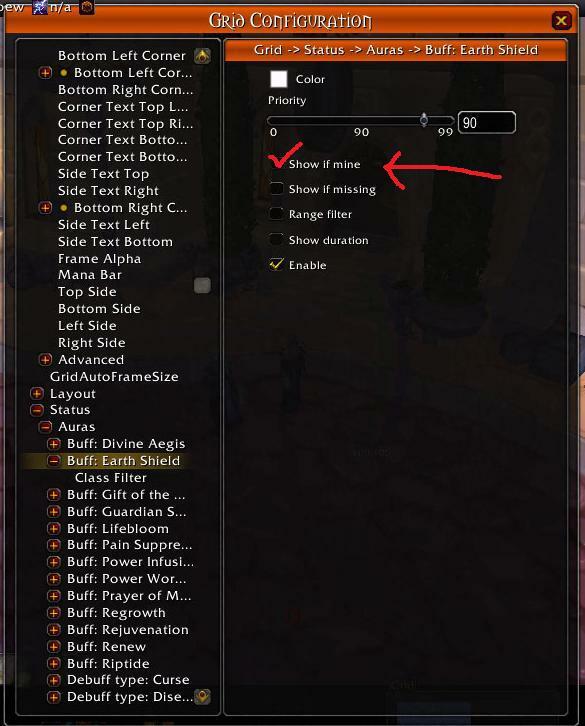 This method is a bit trickier to configure, but can be used for Bacon and other buffs that do not overwrite, such as HoT’s, because you can show your auras and other people’s auras separately. 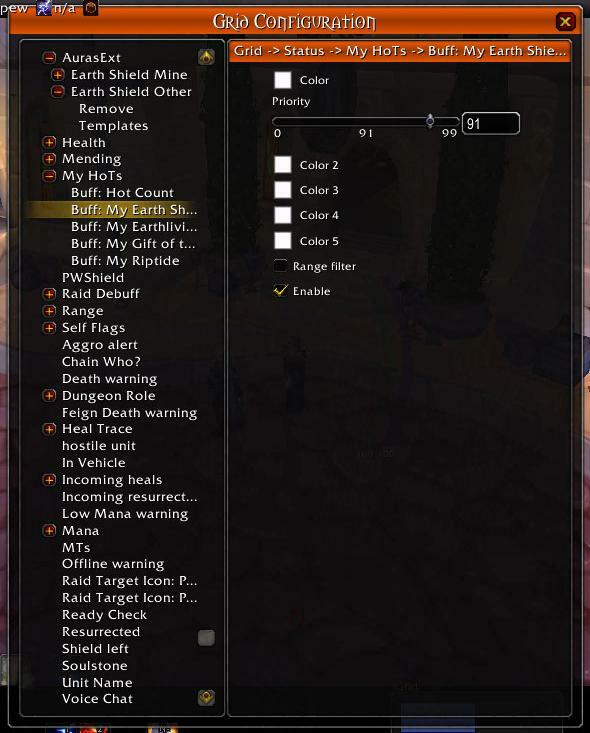 Instead of using priorities to make your shield indicator cover over “default shield for everyone, including you”, we can simply configure the buff indicator to exclude your shield. (1) Create an aura name that is obvious. 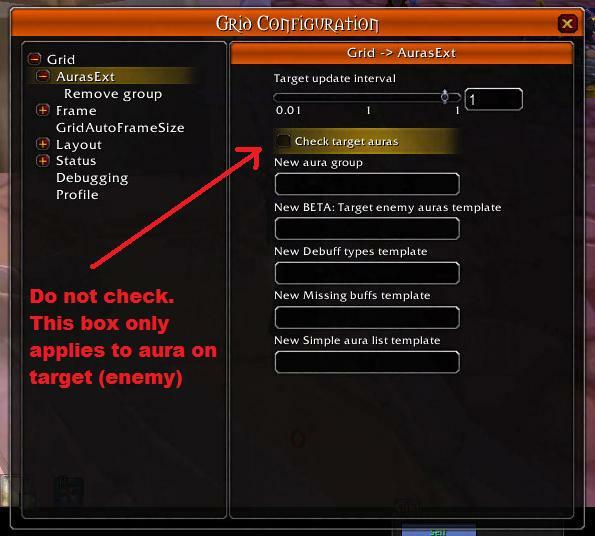 (2) Configure the aura as shown below. 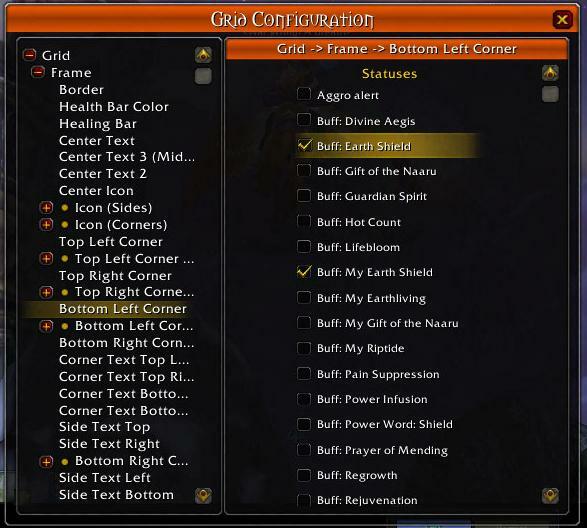 I have no idea why you end up with two sidebar on the left for Auras Ext config. It's irrelevant. Configuring one configures them both identically. You can do a lot with this! Don't get all crazy. By now you know how to do this with AurasExt. Not rocket science. 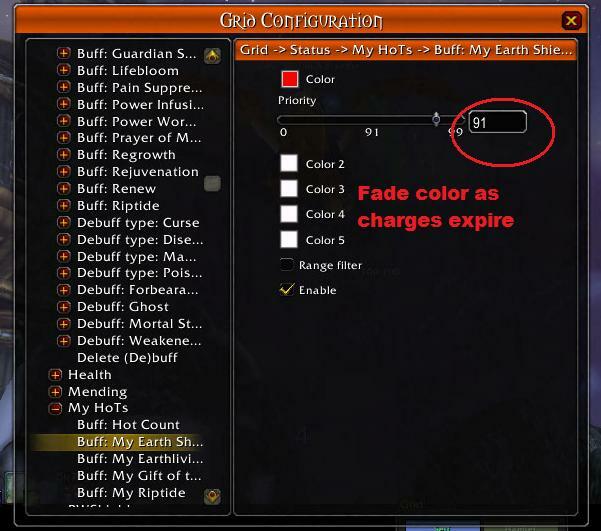 (3) Use Buff: My Earth Shield within GridStatusHots, if you wish to install it. You can fade the color with Gridstatushots. What's there not to like? (1) You can put both statuses in the same corner, using appropriate priorities, just like we did above. 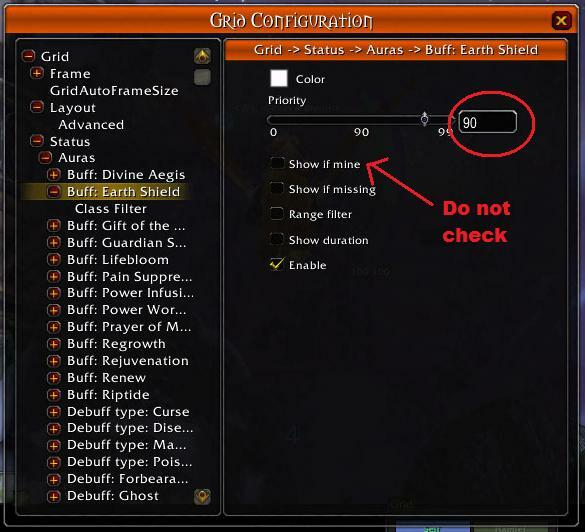 (2) Unlike the above example, you can put your buff in one corner and everyone else’s buff in another corner. This may be useful for Bacon, when you CAN have 2 statuses on the target. See? The statuses you created in GridStatusAurasExt (Earth Shield Mine and Earth Shield Other) are available to put in a corner or wherever. Like MAGIC. Now don’t try to get all funky and do numerical countdowns and crap. That only works with a select handful of plugins, like GridStatusHots. It does not work with GridStatusAurasExt. And that’s the next lesson anyway. It’s useful to know that someone else has a Beacon on your target though, similar to how it’s useful for druids to know there’s a Swiftmendable effect on the target even if it’s not theirs. 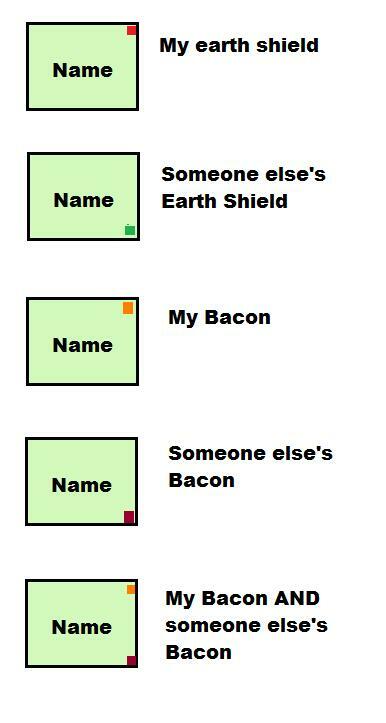 Yeah, someone who wanted to see where all the bacons are should probably use Option 2. Â It really depends whether you run 25’s and what the class composition of your raid is. Â Honestly, it had never occurred to me to use a swiftmend on another druid’s hot, mostly because I so rarely run with another druid. Actually I use the “Swiftmend option present” indicator as a quick and dirty way of knowing where the other druid has dropped Rejuvs. 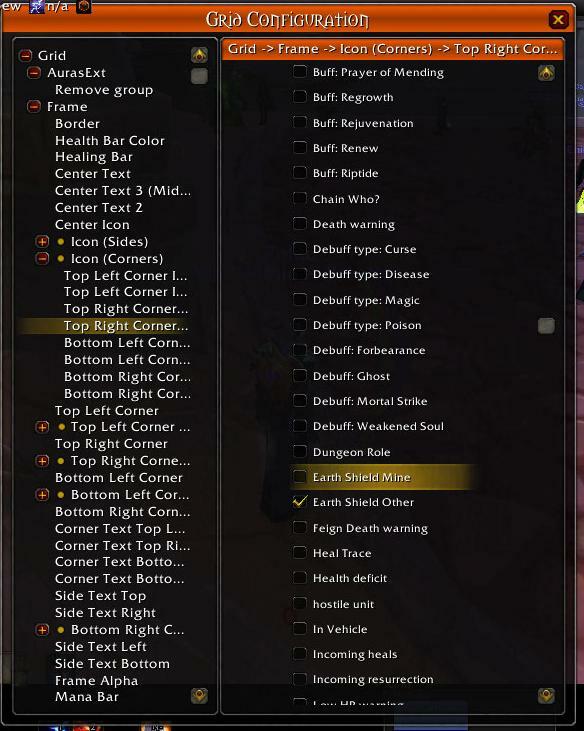 I have my rejuvs and regrowths set to show, but not anyone else’s, so if the “Swiftmend OK!” icon is on and none of my HOTs are ticking, it’s the other druid who’s doing it. It sort of helps me guarantee good raid coverage. I seem to run with other druids a lot… and both times I’ve raid healed as a pally, there’s been another pally. So a little knowledge of where their effects are is super useful. Absolutely, it’s very useful for seeing who’s got Beacon up. I currently only have it set to show any Beacon of Light on anyone, but then I can easily miss if someone’s beaconed my target. I’m going to have to figure out where to place Other Beacon of Light on my Grid. I need more dots, dammit, and I already HAVE the side indicators! How about Corner Plus? That’s 4 indicators in EACH CORNER… 12 extras beyond what you already have. I use cornerplus and LOVE it.Â I put all debuffs in one corner, they all have their own box, and I have tons of indicators to spare. Ooh, definitely worth looking into. Thanks for the suggestion and the link!